In case you don’t know it I celebrated my 20thLeap Year birthday this past February and it was one of the best. In 2012 a neighbor made a collage of that year’s memories of my 19th birthday and, previously, in 2008 James did one up for my 18th and I see them every day and get a smile on my face. This year I decided to make my own collages using mementos of the people, who celebrated my birthday with me, the shows we saw, and restaurants we ate at plus the dinner on Monday, February 29th, 2016, that I had for 20+ people at the Café Vico. I, literally, had over 100 pictures so I knew it would have to be more than 1 collage. Now I have never made or even attempted to make a collage before and I made a load of mistakes BUT I DID IT!!! 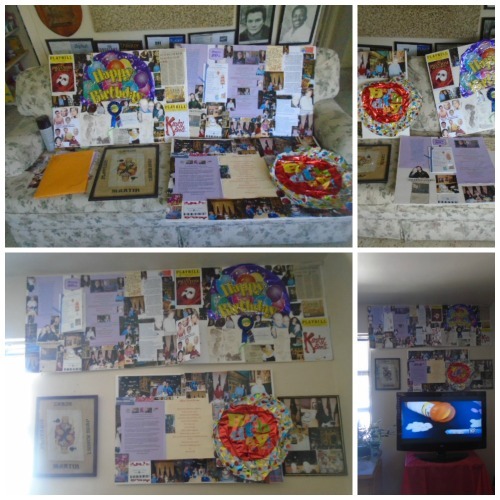 I started it in March and little by little picked all the things I wanted to put in it and finally in June started to work pasting the invitation, Playbills, letter of why they were invited to the dinner, poems that people have written for and about me plus a couple of balloons that had been used at the dinner, a few birthday cards and yes, I went through all the pictures making sure that I had a picture of at least each person that had been there. With all that I put on the boards I needed to frame the needlepoint that Gene sent me plus a few pictures I had forgotten to put with the rest. And, oh my, not a single picture of Chuck and Terry who surprised the heck out of me knocking on my door one day in December since they couldn’t come in February!! They certainly deserve a board of their own so here thinking I am finished I realize that I may never be finished by February 29th, 2020. They may not be the best collages you ever saw, not a thing in proportion, outsized things overwhelming small articles BUT I did it!